The USDA spent a lot of time developing the U.S. Grade Standard for Mangos, but they omitted a few common defects. One is the defect, sunken shoulders, seen below. Damage from heat treatments in mango can result in a range of symptoms. Ripe fruit can be more sensitive to heat damage than mature-green fruit of similar size when subjected to the same heat treatment. High temperature accelerates respiration rate and associated carbon dioxide accumulation and oxygen depletion in certain regions within the fruit. High carbon dioxide levels (>10%) and low oxygen levels (<2%) can kill the cells, which dry out and cavities form in their place. If the affected regions are just below the fruit shoulders, depressions will result around the stem. The heat damage begins immediately after exceeding the time-temperature combination that is tolerated by the fruit (before packing), but subsequent symptom development continues during transportation and distribution. If you slice into the affected, sunken area, you may encounter this symptom, the flesh is dried out, starchy, maybe white to gray in color. 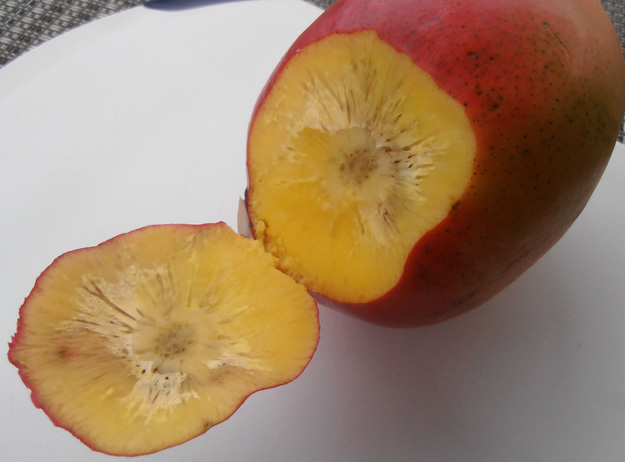 So what do you if find this defect on mangos? The defect can be scored as damage or as serious damage depending on its severity. The USDA has a scoring guideline for “sunken discolored areas,”, score as damage when the affected area exceeds 10% of the surface, or as serious damage when the affected area exceeds 15% of the surface. Unfortunately, what we have pictured here is worse than plain old, sunken discolored areas, as the underlying flesh with this defect is affected. When a defect not specifically mentioned in the grade standard is found, you have to adapt, using a similar guideline. In this case, we woould allow less than 10% of an area affected, probably more like 5% of the surface if the underlying flesh was affected would be scored as damage, and 10% of the surface if the underlying flesh was affected would be scored as serious damage. 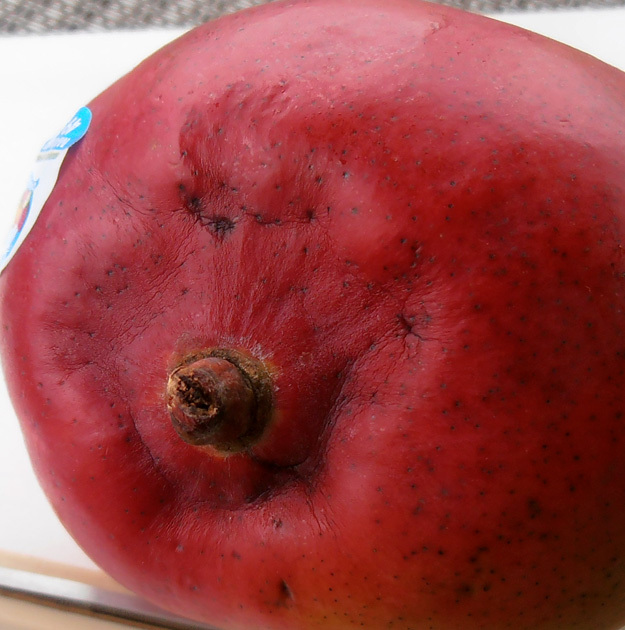 The mango shown above would be scored as serious damage, and the U.S. Grade allows only 5% defects causing serious damage.